This is a fine timber-framed Tudor building with an impressive 18th century brick façade. It is located in Tonbridge's upper High Street almost opposite The Chequers. 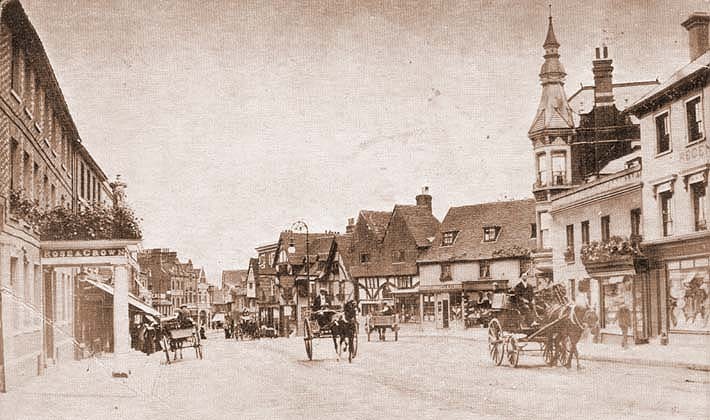 It was an important stopping point for the horse drawn coaches and carriages which travelled from London through Tonbridge to the coast in the 18th and early 19th centuries, with a four horse coach stopping every half hour on weekdays. 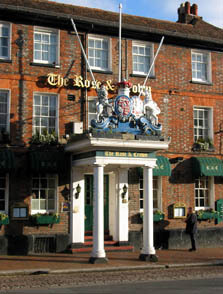 The Rose & Crown was known in the Stuart Court, to Roundheads and Cavaliers, to the diary writers John Evelyn and Samuel Pepys and to all the travellers who passed on their way to Rye, Hastings or 'The Wells' in the wasteland to the south of the parish. 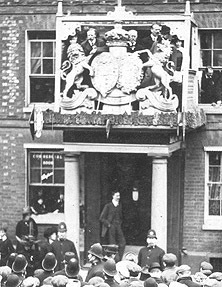 The splendid coat of arms above the porch commemorates visits made to the inn by the Duchess of Kent and her daughter, the future Queen Victoria. The town fire engine was at one time kept at the top of the long yard at the rear of the inn, and before the market moved to the Slade, the town's cattle and general market was held in the High Street outside the Rose & Crown, with a market room inside the inn providing refreshments all day for the farmers and traders. The roof of the large porch which stretches out across the pavement was traditionally the place from which election results were announced. Many parts of the present hotel retain their original character with oak beams and Jacobean panelling.